On my marsh trips I have been getting disgusted with the number of fish that spook when the fly hits the water. Of course how close you cast to a redfish is inversely proportional to his size. The bigger the fish the closer you can cast without risking spooking the fish, the smaller the fish, the further away you should cast. But spoons and lead dumbell eye flies still “ploop” the water and it’s just not a natural sound. Falling back on deer hunting experiences, deer spook on the tiny creaking sound of a stand, or the click of a safety. No matter how small a sound it is, they know it’s not natural to their world. So on my last marsh trip I tied some bend back flies with a bead on the bend and deer hair to insure that it floats point up and to keep the eye up. I got the bead in the bend idea from Rob Meade’s “Gutless Crab” when I saw a version of the fly tied by GCC President, Kyle Moppert. Years ago, a friend convinced me to match the “push button” hatch. 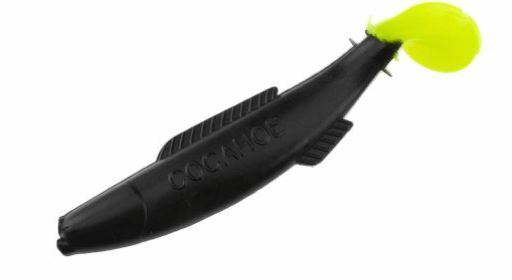 As a traditional bait casting rod fisherman, he was fond of using the famous H&H “Cocahoe Minnow”, black with chartreuse tail which, at the time, were his favorite colors. 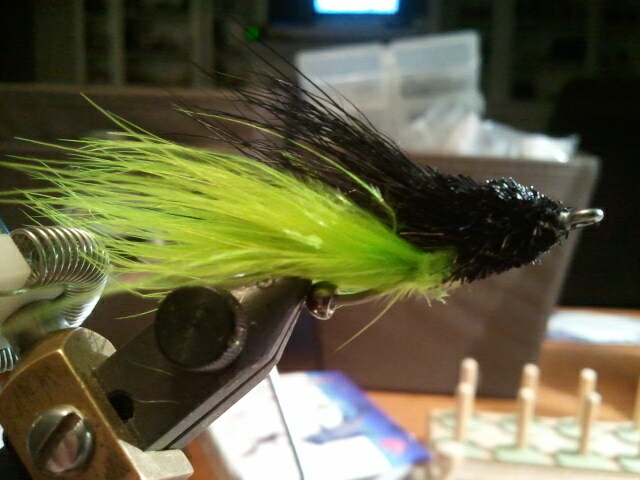 My attempt at tying a fly to meet my friend’s request resulted in a cone head muddler in black deer hair and chartreuse marabou. I was new to the marsh then and I quickly learned that mud flat flies have to ride hook up or they keep a constant collection of grass and goo in the hook bend, and red fish won’t take a dirty fly. I had fish reject it when they approached it and on those occasions the fly happened to have goo and grass hanging in the bend of the hook. I abandoned the pattern, even though it did catch fish when it was clean. For a recent marsh trip I tied some root beer estaz and beige deer hair bend backs with a brass bead in the bend. They worked well. They splash softly, ride hook point up and they cast much better than the heavy spoon flies and Charlies. And importantly, the fish seemed to like them just as well as the Charlie’s I had been casting. Based on that success I decided to revisit the cocahoe minnow with the added info that the Black, Lefleur- style Charlie is one of my best red fish flies. There is a weed guard in the fly you can’t see in the photo. These flies cast much better than spoons and Charlies and they land much softer, without the unnatural and loud, “ploop”. The fly still looks very much like a Charlie. Another popular color combination with the “other fishermen” is blue with pink tail. I have left eyes off the fly because it just adds more weight and who knows what red fish take this for, to me, it doesn’t really look like a “minnow”. Fiddler crab is what I have been told the Black Charlie’s probably are mistaken for. I know one thing, that marabou tail attracts fish! One more thing that is irritating with lead dumbell eye flies and spoons is when they are stripped over a hard sand flat with fish beds, potholes and sand deposits, the hook eye digs into the sand constantly and makes you think you’re getting hits. The deer hair floats the eye on this pattern which makes it come across a hard bottom without the numerous fake “bites”. I watched my flies come across the grass flats this past weekend and the bend back/deer hair had the same effect. The deer hair gave the front end of the fly a little buoyancy and was easier to keep it from falling in the grass. I can’t wait, Red October is upon us!